This extremely stylish silver brooch was designed by Geoffrey Bellamy for Deakin & Francis, the Birmingham silversmiths and jewellers. The oval sliver frame has two gazelles leaping over a ridged mound with bullrushes in the background. It is fully hallmarked for Birmingham 1966 with Deakin & Francis' sponsor's marks and Bellamy's facsimile signature on the rear. This brooch is particularly interesting as it is a design that I immediately associate with Tarratt the Leicester based jewellers with whom Bellamy collaborated. 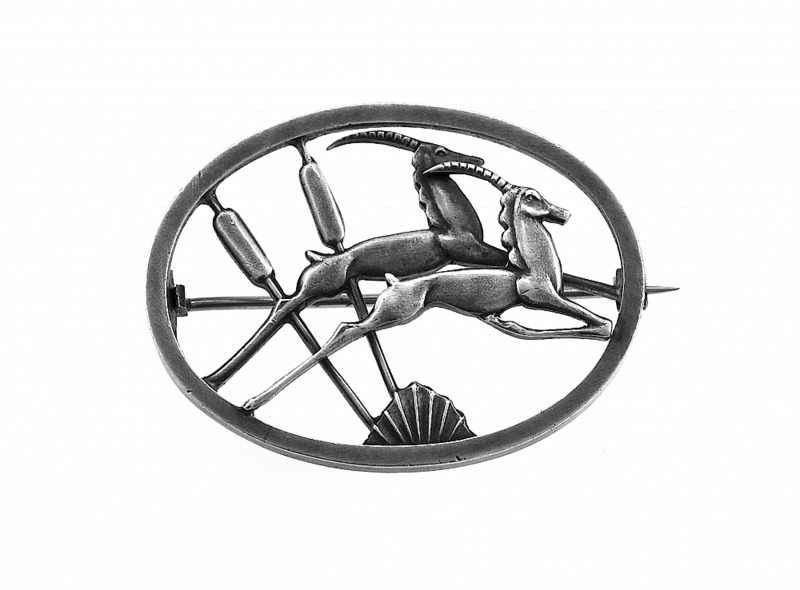 I have had several of these leaping gazelle brooches and this is the first one that is not hallmarked for Tarratt. Those made by Tarratt tend to have an earlier hallmark .Regardless of the manufacturer it is a lovely piece with more than a passing nod to the Art Deco period.